In October of 1949 at the Congregation of Rites, a liturgical commission was named which… was to study whether eventual reforms should be adopted; unfortunately, the calm necessary for such a work was not possible on account of the continual requests by the French and German episcopates demanding immediate changes with the greatest and most precipitous haste. NB this is a reprint of a Rorate Caeli article from five years ago, but well worth revisiting at this time.It gives useful and not-widely-known background to the later and more ambitious program of liturgical reform, and introduces some familiar figures. 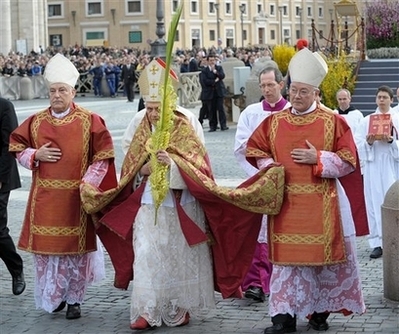 As it happens a friend and I were speculating about the reason for the red cope on Palm Sunday; I’m still a bit puzzled… Ed. In the course of recent years, the publication of numerous studies concerning the history of the theological and liturgical debate of the 1950’s has cast new light on the formation and the intentions (which were not always openly declared at the time) of those who were the actual composers of certain texts. As regards the work of the reform of Holy Week in 1955 and 1956, it is desirable to consider the declarations, finally made public now, of the well-known Lazarist Annibale Bugnini, and of his close collaborator and later secretary of the “Consilium ad reformandam liturgiam” Father Carlo Braga, and of the future-Cardinal Ferdinando Antonelli, in order to establish whether or not their work of liturgical reform corresponds to a wider theological project and in order to analyze the validity of the criteria used and then reproposed in the reforms that followed. We shall consider the notes and minutes of the discussions of the preparatory commission, preserved mainly in the archives of the Congregation of Rites and recently published in the monumental work of the liturgical historian Msgr. Nicola Giampietro, which testify to the tenor of the debate. To the great dismay and frustration of Traditionalists, who rightly see the Mass as the heart of the Body of Christ, Francis appears indifferent to the most pressing need of the Church—liturgical renewal. by Christian Browne, Crisis magazine, February 2016. The third anniversary of the election of Pope Francis seems an apt time to take stock of the state of the Traditionalist movement within the Church. While the term may encompass various goals for the Church, I focus here on its essential aim, namely the restoration and promotion of the Tridentine liturgy. The Orthodox would rightly point to the dilution and tendency towards banality in the modern Catholic liturgical texts. The Orthodox would frown upon the express Sunday liturgies that sometimes are over in 30 minutes. Other worries for the Orthodox include: secular music, Communion on the hand, Communion without fasting, priests facing the congregation, liturgical dancing, women at the altar and excessive use of the laity. Loyal readers may remember a review of a 2007 book Being Human for Human Beings, by Australian Catholic doctor and writer Aniello Iannuzzi. Here is a commentary of a different kind, written with his wife Paraskevi Tsironis, who is from the Orthodox tradition – with an introduction by Sandro Magister, who is well-known to most of us as the Editor of Chiesa Espresso, and thus perhaps be forgiven for describing Coonabarabran as “a village” – Ed. Pope Francis adores making headlines with Muslim, Protestant and Orthodox leaders. Decrying proselytism, Pope Francis and his media operatives advertise all this as oecumenism and dialogue. All agree that unity in Christendom is what our Lord wants. Reality suggests reunifications are only possible amongst the sacramental Churches, as the other ecclesial communities are too different and too varied. Indeed the most serious oecumenical discussions have been those between Pope Francis and Patriarch Bartholomew of Constantinople. A type of new Council in Nicaea has been foreshadowed for them or their successors in 2025. Last weekend, Pope Francis met Patriarch Kirill of Moscow in Cuba. Commentary has ranged from cynical to euphoric. But can these orchestrated manoeuvres realistically result in reunification of the Churches? To do so, three broad areas need addressing: geopolitics, liturgy, sacraments. Fr Pilon’s excellent report from The Catholic Thing provides a historical perspective on some of the trends in modern Catholic funerals we’re analysed in the past – Ed. [The Celebrant, Fr Paul Scalia] stated that he also was fulfilling what he was certain was the will of his father, whom he told us really despised eulogies if for no other reason than that they tended to deprive the deceased of the prayers he would otherwise benefit from if the focus were not on his virtues. I had a Nunc Dimittis moment yesterday, watching the funeral of Judge Scalia. My guess is that I wasn’t alone. 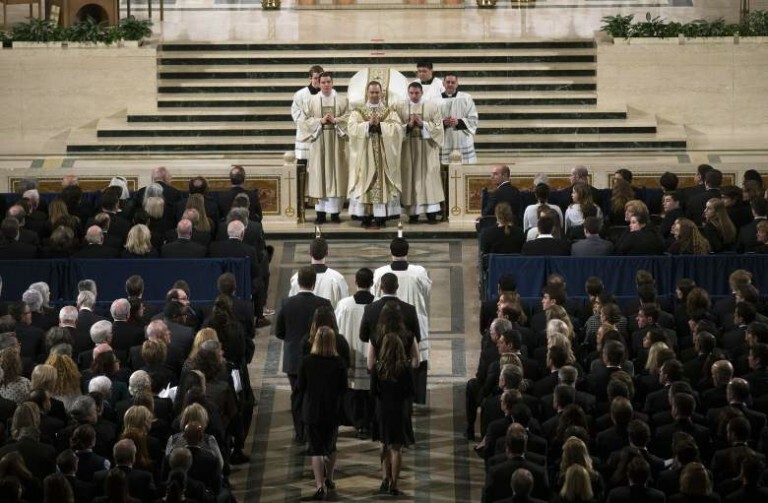 I have been waiting for fifty-two years for some corrective to the kind of Catholic funeral liturgy that began to take hold with the Funeral Mass for President Kennedy in 1963. With that particular liturgy, there began the deterioration of Catholic funerals across this land. And now that has received a certain corrective in the beautiful liturgy at the National Shrine. It was a true liturgy, which means it was focused overwhelmingly on the Lord Jesus Christ and only secondarily on the deceased. The marble iconostasis bears jewel-like icons with a powerful Romanesque gravity. It is a vision of medieval splendor the likes of which have never before been seen in Russia, and only rarely in all the world. by Andrew Gould, Orthodox Arts Journal, 9 February 2016. 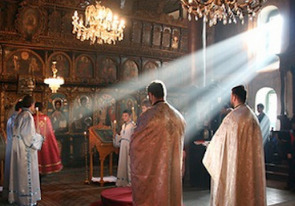 Interior (Photo: Orthodox Arts Journal). This past fall I had the opportunity to visit a construction project that is nothing short of a miracle. I saw a group of mostly volunteers and amateurs, working with small donations, building a church to rival any monument in the history of Christendom. The project was recently completed, consecrated by His Holiness, Patriarch Kirill, on December 27th, 2015. I would like to share what I have learned about this astonishing church.